Let us take a world view. If we objectively look at the world today – study the newspapers, magazines, statistics – there is a lot to be depressed about. The types of pollution, the way people treat each other – so much rudeness, so much selfishness, so much egotism, even families are breaking apart and becoming enemies of each other – there is lot of evil in this world. There is a lot of darkness and cruelty in this world. There is terrorism, crime, so many terrible diseases, so much poverty, there are earthquakes – there was about to be a volcano in Washington DC – and so many strifes in this world. There are droughts, floods, and massive forest fires. Recently I was in a very wealthy part of California, Malibu Beach, Laguna Beach, and they showed me where, just on the verge of the wealthiest houses, there was a massive forest fire, and there was very little they could do. It just depends on the winds and the rain whether your house is going to burn down or not. There is a lot to be depressed about, if you really look at the world as it is. Would you agree? There was a News Paper article in America. I saw it. It talked about how one third of the cause of deaths of the girls under 25 in South India is suicide. That is pretty serious and depressing. That is in a country, in an area that is supposed to be very highly educated and cultured. Suicide is the ultimate expression of frustration and hopelessness. It is a growing disease all over the world. So if we objectively look at the world we will naturally be very depressed. We can be like ostrich. Everyone knows how the ostriches deal with the crises. When the lion comes to eat the ostrich, the ostrich runs, and when he sees the lion coming up behind him, he digs a hole in the ground and puts his head in the ground and thinks, ‘Now I am safe!’ When the fox is coming to eat the rabbit, he uses his ultimate weapon: he closes his eyes and he just forgets that the fox is there. But the fact is that the tiger is about to eat the ostrich, and the fox is about to eat the rabbit. By closing your eyes or sticking your head in the hole in the ground is not going to change situations. So people in the world today, either they do not want to hear about the problems of the world objectively, or they just dig their hole in the ground – in the form of television or some sport event or whatever – and forget it all. Television is very popular. Sporting events are very popular. Do you really think people care so much about who hits the ball or what is happening on this tube that is just flashing lights? People take those things so seriously because they just want to forget the perplexities, complexities, and frustrations of life. It’s a way of sticking your head in the ground or closing your eyes. When Arjuna was faced with the severe perplexity, he could not close his eyes, or stick his head into the ground, he had to face the reality as it was, and he became severely depressed. If a clinical psychologist would read Bhagavad-Gita and see the symptoms of Arjuna, he would say, “This man really needs some medications.” He was shacking. His bow fell from his hand and he turned white. His dark complexion turned white. His mouth was dried up and tears were brimming from his eyes. He was in a hopeless state. He was depressed. Then he decided that he wanted Nirvana. What does that mean? He decided: “Krishna, I’m not going to stay in this battlefield. I’m not going to face this crisis. I’m going to the mountains. Better I just renounce everything and negate the problems altogether. Then I’ll be in nirvana, peace.” But negation of the negative is not the best solution. What did Krishna teach Arjuna in Bhagavad-Gita? He taught him bhakti. That is what Gita is all about: developing a very positive attitude, not on the basis of just physical and emotional, but physical, emotional and spiritual. The depth of our positive attitude is very much determined by how much we have knowledge of our spiritual self. You could be very positive about various opportunities to make money , and very positive to never give up even despite so many failures to invent something. You can work hard all your life, even against all odds, even against all failures. One famous person says, “Success means one who goes through failure after failure after failure, and does not loose enthusiasm.” Another person said, “The only time you fail is the last time you try.” So in that sense somebody who just works really hard and does not give up his hope in what he or she can do, that’s positive thinking. But what happens when old age starts taking away your facilities, and beyond your control, people you love start turning against you? It could happen. There is a famous lady in America who was very famous, everyone knew her name, and everyone bought her products. She was in the top of the world in fame and fortune. Now she is in prison. I am not going to judge whether she is right or wrong. But one thing we can see objectively is, she won’t want to go to prison, but somehow or other no matter how good you do, no matter how great you succeed, things could turn against you. I remember, when I was a little boy, I saw an article in newspaper, about one of the sons of Rockefeller, who died a horribly and a ghastly death, eaten alive by cannibals. They were living in New York City, but he took a trip for some sociological Ph.D. research on the cannibals of New Guinea. And he became the object of food for the object of his study. I remember reading in the paper. Here is the most powerful wealthy man in the entire planet saying, “I will never find another happy day again in my life, because my son is dead.” So, inevitable circumstances can come upon us, which are not in accordance to our plan in life. But ultimately everyone, whoever we are, has to come closer to death. Bhagavad-Gita teaches detachment in this sense: whatever may happen, we should simply be grateful for the opportunity to serve, and find happiness knowing that every living entity is eternal. In reality there is no such thing as death for eternal soul. For a materialistic person, when their loved one dies, it is the end of that person’s existence. That is very hard on the heart; is it not? ‘This person seizes to exist, my own child, my lover, or my parent.’ But Bhagavad-Gita teaches the positive attitude, which is not based on sentiment. It is based on truth that there is no death for anyone. We can do something. If our loved one dies, we can do something for them: we can pray for them, perform pujas and do service to God in a spirit of compassion to them, and their souls will get the benefit. In the tradition of India there is a process for this called sraddha and pinda for the departed ancestors. In Srimad Bhagavatam it is said that one who surrenders to Krishna, twenty-one generations of all relatives, in past and in future, get liberated. There is something positive that we can do to show our love even for the departed souls. Otherwise we just burn a candle and cry, because they are dead and gone. 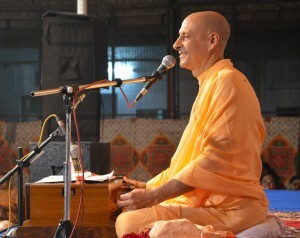 6 Responses to "Positive Attitude is incomplete without Spirituality"
HH Radhanath Swami so nicely highlights this holistic understanding from Bhagvad Gita – “Do your work for the welfare of others, in a spirit of compassion to others, with consciousness of your relationship with God.” This clarifies the common confusion on this point. I too loved this highlight by Radhanath Swami. Hare Krishna. I would like to find the entire lecture, could you please post a link for it. thank you very much for your kindness. When we run away from real problem of life getting temporary solution to the temporary problem is like a small coin putting near our eye and saying the Sun is smaller than this coin. The positive attitude is to understand the real problems of life and to find the solution of them. The positive attitude for achieving material things only bring us comfort but will be the cause of another suffering. Agree. Radhanath Swami emphasized on spirituality for real positive attitude.